ClickHERETo Learn About This Brave And Daring Thoroughbred! ClickHERETo Read About This Fantastic Book! ClickHERETo Be Introduced To This Powerful Author! ClickHERETo Watch The Awesome Races! ClickHERETo Order From Timothy J. Thompson Personally And Receive Two Free Gifts! ClickHERETo Visit The Grit And Valor Gift Shop! ClickHERETo Visit Tim Thompson's Historical Publications Website Where You Can Browse Aisle After Aisle Of The Finest History Books Ever Written! A very handsome and famous photo of the indomitable Swale storming his way to a dynamic and smashing victory at the one and only Kentucky Derby! TTHP would like to congratulate the great JUSTIFY, a fourth generation Slew, on becoming the 13th Triple Crown winner. He has stormed his way into the record books. Way to go JUSTIFY!! 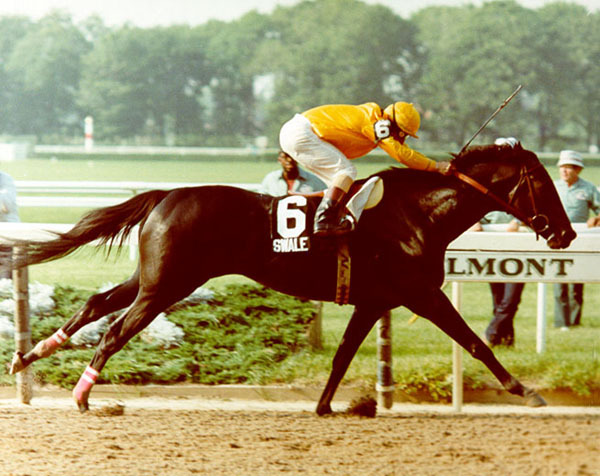 An outstanding photo of Seattle Slew's son, SWALE crossing the finish line at the 1984 Belmont Stakes on June 9 1984. Swale led the race practically from start to finish, winning by more than 4 lengths in the very impressive time of 2:27 1/5 for 12 grueling furlongs! 1984 Florida Derby, Kentucky Derby, and Belmont Stakes Winner! Celebrate the 34TH Anniversary of Swale's dynamic and spectacular victory at the 1984 Kentucky Derby at historic Churchill Downs with a wonderful book all about his great life and amazing career! Greetings friends! 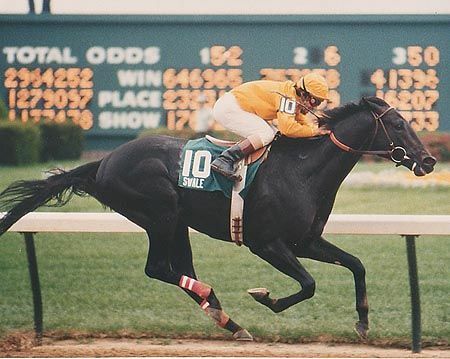 This website is dedicated to the memory of Seattle Slew's son, Swale. He was a great champion who deserves to be in the National Horse Racing Hall of Fame. Hopefully, one day, he will get there. I loved him so much, I researched and wrote a book dedicated to his everlasting memory. It is entitled: Grit And Valor: The Story Of Swale. On June 9, 1984, Swale stormed to a decisive victory at the Belmont Stakes. It was, arguably the greatest victory of his stellar career! The magnificent photo directly above shows SWALE storming to a decisive four length victory at the 1984 Belmont Stakes. This amazing book, about one of Seattle Slew's greatest sons, is a must read for any horse lover, animal lover, and thoroughbred horse racing enthusiast of any background. This is the type of book that will keep you on the edge of your seat with dynamic and suspenseful writing, as well as intriguing facts and figures that you have never before been aware of. 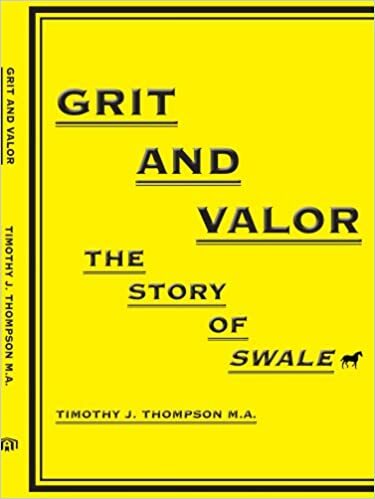 Grit And Valor: The Story Of Swale is so compelling, you will never be able to put it down! The book will make you laugh, it will also make you cry. It will bring out emotions in you that you never before thought you possessed. As far as books go, it will be one of the best investments you will ever make. Check out the video below in which I talk about my book in greater detail.